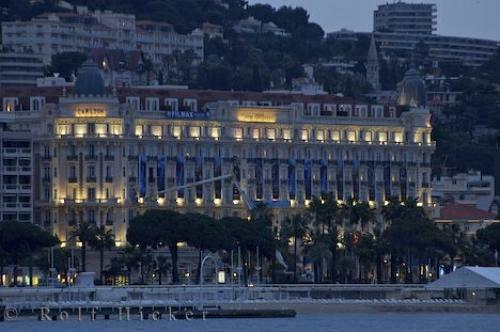 The height of luxury is the Carlton Hotel in the famous town of Cannes, Provence, France. The Carlton Hotel, built 1911, along the waterfront of Cannes, The Riviera, Cote d'Azur, Provence, France, Europe. Photo of the historic Carlton Hotel overlooking the beach in Cannes on the Cote d'Azur, Provence, France.